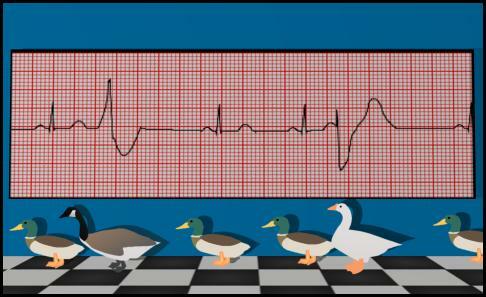 I'm frequently asked if there is some way that I can explain the concept of the human heart's premature ectopic complexes using waterfowl. In response to these requests, I have put together in this section an extended metaphor that addresses the topics common to premature atrial, junctional, and ventricular complexes. Figure 10-1 shows a number of mallards marching along. 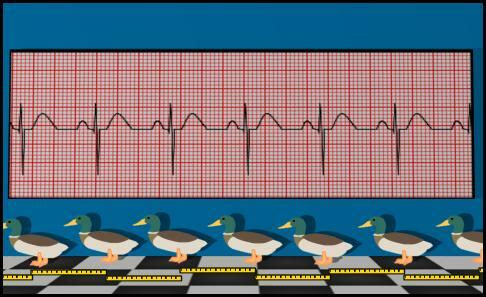 Each mallard represents the ECG complex above it. Let's assume there exists some commander of the ducks (who is not shown in the diagram). He is very picky when it comes to marching, and he requires that each duck maintain a specified distance between himself and the duck before him. This distance is the length of a single ruler (shown below ducks). Figure 10-1 : Sinus ducks marching. Each duck is ordered to maintain a ruler's length distance between the duck ahead of it and itself. Now let's look at the duck-duck-goose patterns. 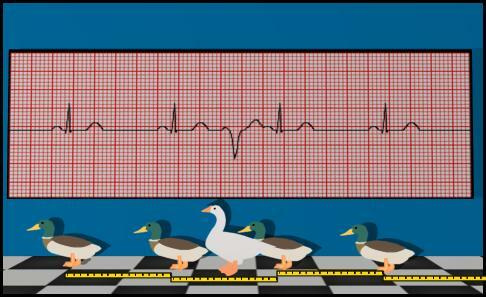 In figure x-x, you see that a goose (representing a ventricular complex) has joined the parade. He took ("stole") the place of one of the "regularly scheduled" ducks. In addition to this, the goose is following a little too closely (much like bad drivers do). Thus, we call this goose premature. The duck can ignore the goose and follow one ruler's length behind where the missing duck would have been. This is the equivalent of following the length of two rulers behind the previous mallard (the one before the goose). Compensating for the too-short distance before the goose, the distance after the goose would be longer than a ruler. This "distance" is called a compensatory pause. The duck could march at a distance of one ruler's length behind the goose. This would mean that the goose has shifted the entire marching formation behind him a little bit more forward than they would have been. There is no compensatory pause. Figure 10-2 : A premature waterfowl (followed by a compensatory pause). Even though the goose takes the place of one of ducks, it does not alter the overall spacing of the group. This is exhibited by the compensatory pause following the goose. Figure 10-3 : Premature waterfowl (no compensatory pause). 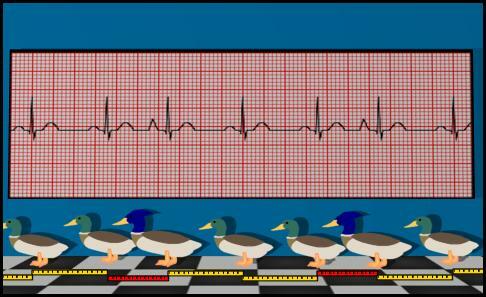 Notice how the overall pattern is reset by the blue-headed (premature) ducks. The red rulers indicate a distance that is too short. The mallards that follow the premature ducks are basing their position on these blue-headed troublemakers. In the heart, the "option" is usually decided by where the premature complex originates. Those complexes that cause a compensatory pause are those whose impulse does not reach the normal (sinus) pacemaker. Lack of the compensatory pause is generally attributed to the impulse from the premature complex conducting retrograde towards the sinus node and resetting it. Although this is by no means a fixed rule, PACs (and PJCs) tend to reset the sinus while PVCs tend not to reset the sinus. Thus, if a premature complex is followed by a compensatory pause, you should suspect a PVC. Sometimes, a goose may be able to squeeze between two ducks without messing with their pattern at all. When this happens with an PVC, we call it an interpolated PVC. An interpolated complex is a premature complex that is early enough so that no complex is skipped. Thus, in figure 10-4, there are no missing ducks. Figure 10-4 : An interpolated goose. This is a premature goose who, rather than take the place of one of the ducks, has managed to squeeze between two ducks without altering their pattern. No ducks have gone missing. Remember the following generalization : different shape means different origin. The QRS shape often reflects where the impulse entered the ventricular conduction system. As far as the ventricles are concerned, pacemakers in the sinus node, atria, and the junction (normally) all share the same path. Thus a sinus complex, a PAC, and a PJC are all likely to have similarly shaped QRS complexes. Pacemakers in the ventricular conduction system are not limited to one location; they can occur in a variety of places. These different places should produce different QRS complexes. For example, in figure 10-5, we see two different PVCs. We should assume, because of their dissimilarity, that these PVCs each originated from a different part of the ventricular conduction system. Thus, we designate them multifocal. If all of the PVCs had the same general shape, we would refer to them asunifocal. 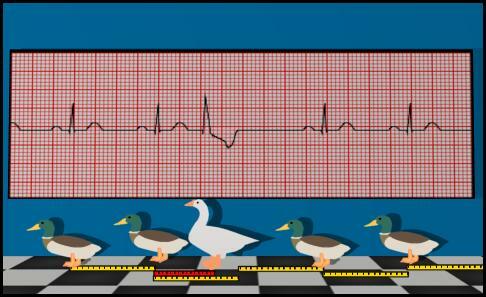 Figure 10-5 : Mallard rhythm with multifocal geese. These terms describe how often the premature complexes appear. If their appearance seems random, none of the following terms are applicable. The term salvo (as in barrage) is used to describe the occurrence of multiple premature complexes in a row. (Many consider "multiple" in this case to mean three or more.) When many premature complexes occur in a row, you should probably start looking at them less in terms of premature complexes and more in terms of tachycardia.